Nearly 2,500 kg of banned firecrackers were seized and at least 1,029 people arrested during two days of Kali Puja and Diwali celebrations in the metropolis, police said on Thursday. Raids were carried out at different places of the city, including EM Bypass, Beliaghata, Bhowanipore, Behala, Dum Dum, Kasba, Patuli and banned firecrackers weighing about 1,348.80 kg were seized till 4 pm on Wednesday, a senior police officer said. Another 1119.7 kg of illegal fireworks were recovered till 4 pm on Thursday, taking the total seizure amount to about 2,500 kg, he said. Around 757 people alone were arrested for bursting banned firecrackers in the two days, the officer said, adding, many were held for unruly behaviour as well. The total number of complaints received by Kolkata Police during the two-day festive period was 176. Over 7,900 kg of illegal firecrackers, including over 2,500 kg on Diwali, have been seized from various parts of the national capital since the Supreme Court ordered a ban on sale of old crackers, police said Thursday. A total of 113 cases have been registered and 124 people arrested for violating the apex court's October 23 order, they said. According to police, over 2,500 kg of illegal firecrackers were seized from various parts of the city on Diwali and 87 people arrested in connection with 72 cases registered in this regard. "Delhi Police has seized 2,776 kg of illegal firecrackers from across Delhi on Diwali. Eighty-seven people have been arrested and 72 cases were registered in connection with illegal sale of firecrackers," a senior police officer said. Out of the 72 cases, eight cases were registered in southwest Delhi and 208 kg of firecrackers were seized. Three cases were registered in east Delhi and 165 kg of firecrackers were seized. In northeast, five cases were registered and 214.3 kg of firecrackers were seized while seven cases were filed in Shahdara and 176 kg of firecrackers were seized, the officer said. In central Delhi, six cases were reported and three cases were registered in north district of Delhi, he said. According to police, eight cases were registered and 112 kg of firecrackers were seized from northwest district. Four cases were filed in Rohini and subsequently, 794.5 kg of firecrackers were seized. In south district, four cases were filed and 100 kg of illegal firecrackers were seized, the senior officer said. Similarly, in southeast district, 10 cases were registered and 278 kg of firecrackers were seized. In west Delhi, four cases were registered and 100 kg of illegal firecrackers were seized, he said. Six cases were registered in outer delhi and 212 kg of illegal firecrackers were registered. In Dwarka, 13 cases were registered and 417.6 kg of firecrackers were seized, police said. Delhi recorded its worst air quality of the year the morning after Diwali as the pollution level entered the "severe-plus emergency" category due to rampant bursting of toxic firecrackers, authorities said. People in several cities burst firecrackers until at least midnight, two hours after the 10 pm deadline set by the Supreme Court. Tamil Nadu topped the southern states in the number of cases filed for violation of Supreme Court's time-limit for bursting of crackers on Deepavali day with 2,190 FIRs while none were booked in Karnataka and Andhra Pradesh, police said. In Telangana, police booked over 75 cases in Hyderabad while in the union territory of Puducherry around 30 cases were registered for violating the two-hour window set by the apex court for bursting crackers. Noise pollution was low in Andhra Pradesh while in Tamil Nadu the air pollution levels dipped across the state on deepavali day, reports from the states said. Tamil Nadu and Puducherry celebrated deepavali on Tuesday while the other southern states on Wednesday. The festival is not celebrated on a largescale in Kerala compared to other states and crackers are burst mainly during "Vishu", the Malayalam new year. Among the state's 32 districts in Tamil Nadu, Chennai topped the list in violations of the time limit for bursting crackers with 359 cases followed by Coimbatore 184, Villupuram 160 and Virudhunagar 134. Theni recorded the lowest of five cases, police said. However, no arrests were made since the offence was bailable in nature, a police official said in Chennai. The Chennai Corporation Thursday said it removed 95.06 tonnes of cracker waste deploying 19,000 civic personnel. The Tamil Nadu pollution control board has said air pollution levels dipped across the state on deepavali day. Citing data being collated from several parts of the state, an official had Wednesday told PTI that there was a definitive drop in air and noise pollution levels on the day (when compared to previous years) and surveys showed that the parameters conformed to set standards in most regions. A report from Amaravati quoting police said 80 per cent of people complied with the apex court directive. More than booking cases, we stressed on creating awareness among people on the Supreme Court directive. All our Commissioners and SPs conducted a campaign ahead of the festival and that yielded results," a police spokesman said. Over 80 per cent people followed the apex courts order while there were sporadic cases of violation, he added. State Pollution Control Board Chairman B A S Prasad said reports on air quality across the state post-Diwali were expected in a day or two. "...sound pollution declined significantly as bursting of crackers also fell for a variety of reasons," he told PTI. Hyderabad Police Commissioner Anjani Kumar Thursday said over 75 cases had been booked against people who violated the Supreme Court order. The Telangana State Pollution Control Board in a statement said the Particle Matter of size less than 2.5 microns ( PM 2.5) has increased by 61 per cent and PM 10 rose by 34 per cent on the festival day compared to normal days. The noise levels increased marginally in residential and sensitive areas while it decreased in industrial areas. The gaseous parameters were within the limits, it said. In Karnataka, though people burst crackers till 12 midnight, police said no cases had been registered. The Karnataka State Pollution Control Board chairman Lakshman told PTI that the board issued directions to various departments concerned about the implementation of the order. The boards teams too ensured that the crackers within the permissible decibel levels were sold. State DGP Neelamani M Raju said by and large the implementation of the court order was "largely successful." The Odisha police have registered cases and collecting penalty from at least 370 people in the twin cities of Bhubaneswar and Cuttack for violating the Supreme Courts 8pm to 10 pm directive on bursting of crackers during Diwali, Cuttack-Bhubaneswar Police Commissioner Satyajit Mohanty said Thursday. The police registered cases against 140 people of the two cities for allegedly bursting crackers beyond the time frame set by the apex court on Wednesday. The police have also collected a penalty of Rs 1.15 lakh from 230 persons for the violation, Mohanty said. The Supreme Court had on October 23 specified that firecrackers could be burst only between 8 pm and 10 pm on Diwali night, he said. As many as 35 persons were arrested from different parts of Ahmedabad city for flouting a Supreme Court order that limited the bursting of firecrackers from 8 pm and 10 pm on Diwali, police said Thursday. These 35 persons were arrested Wednesday night under IPC section 188 (disobedience to order duly promulgated by public servant) and were granted bail later, an official said. The arrests were made from Vastrapur (3 persons), Vejalpur (2), Paldi (5), Ellisbridge (4), Satellite (2), Anandnagar(4), Sarkhej(8), Shahibaug (4), Bapunagar (2) and Naroda (1). These persons were caught red-handed while bursting firecrackers in violation of the SC order as well as a notification issued by police commissioner A K Singh, the official informed. After the SC order, Singh had issued a notification on November 3 asking people to refrain from bursting firecrackers before 8 pm and after 10 pm on Diwali. "We have arrested three persons bursting firecrackers on the night of Diwali. They were caught red-handed during our patrolling. Since the offence under IPC section 188 is a minor one, they were granted bail from the police station itself," said Vastrapur police inspector M M Jadeja. In some parts of city, police officials, equipped with public address systems, made announcements asking people to adhere to the SC guidelines. "Ahead of Diwali, we visited societies and used loudspeakers to warn people that action will be taken against violators. This made a huge impact, as most people stopped bursting firecrackers after 10 pm," claimed O M Desai, police inspector of Amraiwadi, where no case was registered. No FIR was registered here till Thursday evening for violation of the Supreme Court's restrictions on bursting firecrackers even though they could be heard beyond the 10 pm deadline on Diwali. The Supreme Court had allowed people to burst firecrackers from 8-10 pm. No FIR has been registered as no complaint has been received in this regard, Shimla Superintendent of Police (SP) Omapati Jamwal said. "If any complaint is received in this regard, action will be taken as per law," he told PTI. There are reports from several areas of Shimla, including Jakhu, Chhota Shimla, Khalini, Lower Bazar, Summer Hill and Lakkar Bazar localities, of people bursting firecrackers before 8 pm and after 10 pm, residents said. Some people were bursting firecrackers even after 10 pm, appropriate action should be taken against them for violating the Supreme Court's directions, Dr Archana, a resident of Jakhu, said. Firecrackers should be banned as the pollution caused by them affects each and everyone in one way or the other, a resident of Chhota Shimla, Dr Ritu Kalra said. "My mother is unwell and the air and noise pollution created by firecrackers affect her adversely. It will be the same for other ailing people. Even other citizens and animals are affected by firecrackers," she said. Dr Kalra, who runs a dental clinic at the busy Mall road here, said saplings should be planted to minimise the affect of pollution. The police in Chamba and Bilaspur districts also did not register any case for violation of the Supreme Court order. Monica Bhutunguru and Ashok Kumar, SPs of Chamba and Bilaspur respectively, confirmed this. Mumbai witnessed a noisy Diwali this year despite the Supreme Court putting restrictions on bursting of firecrackers. Some residential areas in the city recorded "high" noise levels Wednesday night against the permissible limits, said environment activist Sumaira Abdulali, the founder of NGO Awaaz Foundation, which has been campaigning for bringing down noise levels. Seven people were detained for allegedly flouting the apex court's guidelines and bursting crackers beyond the permissible time limit, police said Thursday. In gross violation of the apex court's order, people in some parts of the megacity burst firecrackers even after the 10 pm deadline. The Supreme Court had last month permitted sale and manufacture of low emission "green" firecrackers countrywide and fixed a two-hour time period from 8 pm to 10 pm for bursting them on Diwali and other festivals. Abdulali's team conducted noise level tests at several places in the city, including Bandra, Worli, Juhu and Santacruz, on Wednesday night. "At some places, noise up to 114.1 decibels was recorded against the permissible limit of 55 decibels in residential areas," she told PTI. "All I can say is that the Supreme Court's guidelines were flouted, but the state government and its machinery tried their best to check people and adhere to the permissible time limit. Since the last few years, the noise level is coming down," she said. Abdulali said the Awaaz Foundation's report indicates that all firecrackers tested by it are unsafe for human health and that none of them could be classified as 'green'. She reiterated her demand for the state government's intervention to facilitate a proper chemical analysis of firecrackers. The seven people were detained by police at the Marine Drive in south Mumbai Wednesday late night for bursting firecrackers beyond the permissible time limits, senior police inspector Vilas Gangawane said. They were taken to the police station concerned and fined as per provisions of the Bombay Police Act before being let off, he said. Besides, offences were registered against two unidentified persons in suburban Mankhurd for flouting the apex court's directive, another police official said. The Mumbai Police's Twitter handle also saw a flurry of complaints from across the city of violation of the Supreme Court's directives on bursting of firecrackers. The complainants were asked to approach their area police station concerned, an official said. 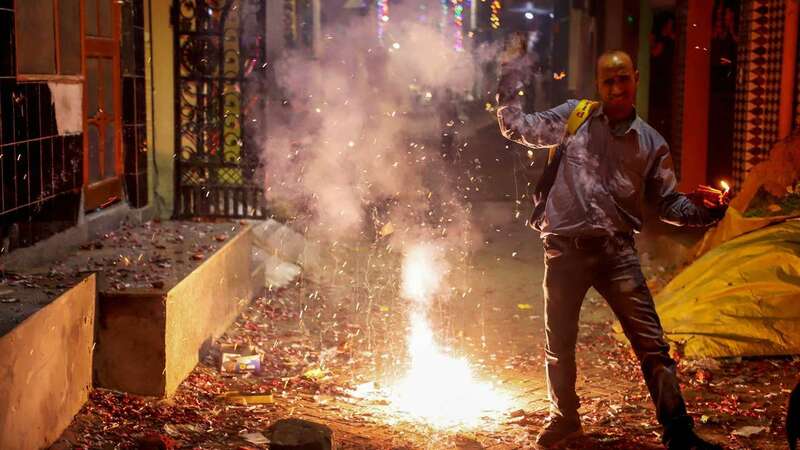 "We have asked all police stations to follow the Supreme Court's guidelines on bursting firecrackers and to ensure action against those violating it," Mumbai Police spokesperson Manjunath Singe said. Mani Kumar Iyer, a resident of suburban Ghatkopar, complained that some people continued bursting crackers even past midnight. "There were no one to check them," he said. Another resident from the area, who burst crackers till around midnight, was pointed out the SC guidelines. However, he said, "I have been doing this (bursting crackers) since I was a child and would keep doing this. Is this a crime?" Santosh Kumar Singh, a resident of the neighbouring Pune district, said had there been an advisory instead of a ban coupled with the state government's positive campaigning, it would have worked better. The state government had earlier issued directives to senior officials to ensure compliance with the Supreme Court's order putting restrictions on sale and bursting of firecrackers.